The Quiz stirs up controversy. 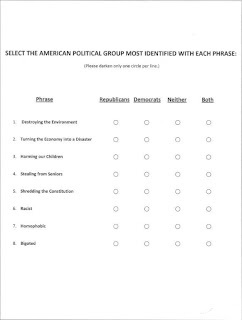 It poses the themes of the Democratic Party in the form of a questionnaire, and makes people uncomfortable. People are forced to momentarily dwell outside their comfort zone. 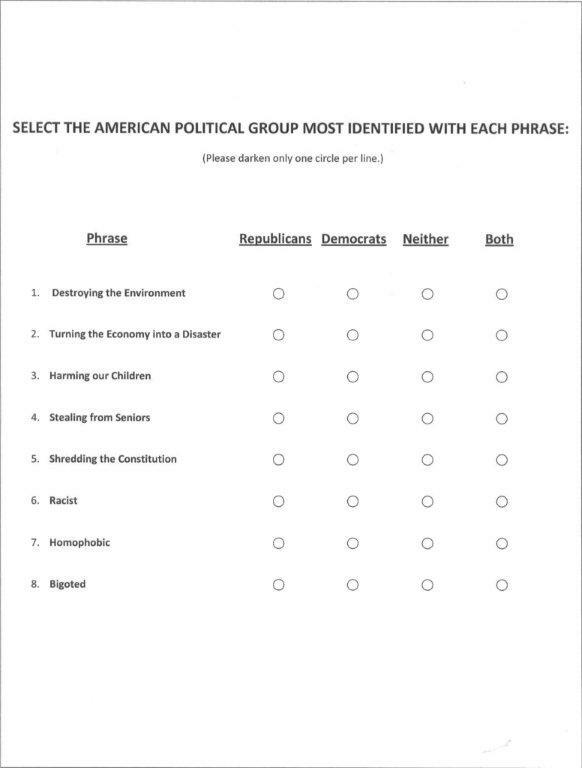 The reason for the discomfort associated with this piece of paper is that our anti-Republican culture considers it unacceptable to place a mark in the column labeled “Democrats.” The characterizations that are listed should only apply to Republicans and need not be challenged. Who should take The Quiz? This is where the fun begins. Suppose The Quiz is administered to a gathering of behavioral scientists, and they agree that Republicans are associated with the characterization of “homophobic.” Given this outcome, is it possible that a Republican can be cured of “homophobia” by simply going down to the local County Clerk’s office and changing political registration? What if this finding is published as a part of “homophobia research”? Hopefully, our hypothetical scientists will be intrigued by our American culture and its tenet that only Republicans are guilty of homophobia. Maybe they would consider addressing the issue of gay Republicans having to brand themselves as “Log Cabin Republicans.” While they are at it, they could even examine if any political influences are coloring their work. Taking the cultural issue a step further, can it be “right and natural” that in America it is humorous to joke about lynching a white woman? Republicans want to exact a political price for our success. Their plan is this: Use the midterm elections to strengthen their numbers, weaken Democrats, repeal health care reform and destroy President Obama. 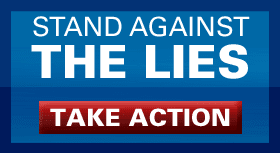 And they are more than willing to lie to do it. On top of everything else, the Vice President of the United States thinks it is right to characterize Republicans as liars. Don’t wait for anyone to challenge his legitimacy. Our anti-Republican culture approves. Lisa Gartner at The Examiner writes about a survey given to students in Virginia. It shows the progression of student attitudes about honesty and cheating from grades 6 through 12. It would be interesting to see a similar study associated with "The Quiz." My sense is that with grade progression, our culture instills ever-stronger anti-Republican sentiment in public school students. It would be interesting to see if a survey bears that out.